If you regularly read Hackaday, you probably won’t find the electronic part of the build remarkable. However, that’s kind of the point, as this is all off-the-shelf and inexpensive. They do however modify the boards in some cases to allow the controller to power them down, for example. In fact, they put a lot of thought into reducing power requirements. Since your eye is more sensitive to green, for example, they use green LEDs with very low currents as indicators. They also speed up the serial bus going to sensors because they found that the increased power required was more than offset by finishing the transaction faster (and, thus, going back to sleep sooner). The PVC enclosures are also interesting. The paper shows some practical deployments in some very harsh conditions. If you want more practical details, the Cave Pearl project has been blogging about their development of these loggers for a while. They have a good “how to” page, as well. If an Arduino seems too last-year for you, we’ve seen long-duration logging done with ESP8266s and ESP32s. However, they did use lithium-ion cells. Spoiler alert: The ESP8266 lasts longer than the ESP32. If you want to minimize power when sending things out over a network connection, consider MQTT. Create a digital bird feeder that can monitor weather and bird activity. The post Make a Bird Activity Monitor and Feeder with Arduino appeared first on Make: DIY Projects and Ideas for Makers. Wanting to see data from their high school’s HAB launch, 9th grader “Spaceshark” and a few of his classmates decided to build their own data tracker. According to the project’s write-up, Spaceshark’s school has an astronomy club which sends HABs to the edge of space. Although the 360-degree video embedded here would be enough to satisfy most people’s curiosity, this team wanted more data! Spaceshark’s group proceeded to create a data logger using an Arduino Uno, along with sensors to collect data on the satellite’s latitude and longitude coordinates. Altitude, wind speeds, time, and the satellites in view can also be recorded, saving readings on a microSD card for later analysis. 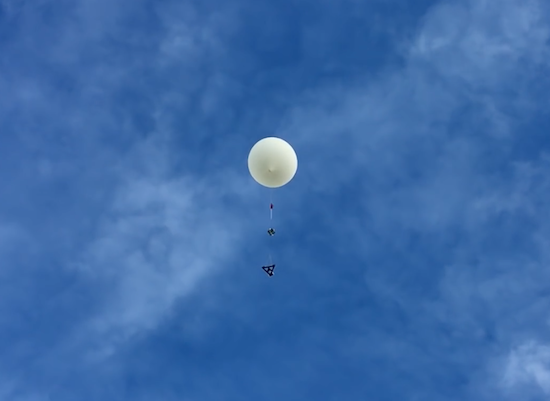 Since these type of balloons can reach heights of 100,000 feet, the fact that the boards used could get quite cold, as well as the question of whether or not the GPS used would work at that altitude, had to be considered. You can find more details of this build on its Instructables page here. Scientists working in a lab are just folks. Like motor heads with cars, we have our favourite makes and models—except with scientists, it's all about the lab equipment. This is the story of a group of college students who moved to the Mojave Desert, bought a house, painted it white, and turned it into a make-shift lab. Then they went out to launch rockets. My son finished the last of his college application essays today—a letter of intent for the College of Creative Studies at UCSB. UCSB is more of a safety school for him than a first-choice one, but they have a decent CS department, and the College of Creative Studies is a better honors program than the other UC campuses have. It looks like that program provides enough flexibility in the general ed requirements that he would have relatively few courses to take that he did not choose for himself—certainly less than the rather specific laundry lists of UCSD colleges or UCB. I had to bicycle down to the post office to mail paper copies of the application forms to the College of Creative Studies, because my son was running late for his afternoon appointment, and the forms really needed to be postmarked today. It seemed a bit weird and old-fashioned to be sticking stamps on a big envelope and mailing it from the post office for a college application. Of course, the College of Creative Studies is small enough that they can’t really afford to set up their own on-line application system, and UC is not about to modify their system to accommodate a small college on one campus. Now that he has finally finished his essays, I’m hoping to get him to spend some time on two subjects he’s been neglecting: group theory and updating the data logger to work with the Freescale processors (along with lots of other upgrades requested on the bitbucket site). I’ll have to tell the lab staff soon which processors the students will be buying for the spring quarter Applied Circuits course. If the data logger is not working with the KL25Z boards, then we’ll have to continue using the Arduinos. The Arduinos worked well enough last year, but we could run much higher sampling rates and higher resolution on the KL25Z boards. 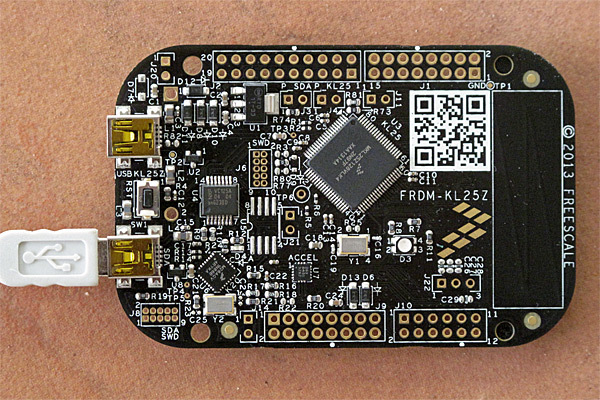 I’m also wondering whether I should get a KL26Z board, which has 14-bit resolution for 3-axis acceleration measurements and 16-bit resolution for 3-axis magnetic measurements (the KL25Z board has only 12-bit resolution for 3-axis acceleration and no magnetometer). Both boards have 48MHz ARM Cortex M0+ processors with 28kB of flash and 16kB of RAM, and use similar OpenSDA interfaces for downloading programs. The KL25Z is supported by free software from mbed.org, but the KL26Z does not seem to be (yet—they do support the KL46Z). On Tuesday, 2013 July 16, I ordered Freescale’s new $13 KL25Z development board from Digi-Key as part number FRDM-KL25Z-ND, they shipped it within an hour and a half, and I got it on Thursday, 2013 July 18 (shipping charges were $3.43, but I had ordered a few other parts at the same time). My KL25z board with a USB cable plugged into the SDA USB port. This is the port used for downloading. The other USB port is used for serial communication, mouse or keyboard emulation, and so forth. The board does not come with any headers, so I’ll need to buy a 2×6, 2 2×8, and a 2×10 female header to solder in. These will add about $3.36 $5 to the cost of the board—more since I neglected to order them with the board and so will have to pay shipping again. The headers would cost $2.05 $3.07 in hundreds, which would be the right quantity to buy if we used the boards in a lab course. (I had the wrong female headers selected before—the 2×3, 2×4, and 2×5.) Adding headers would have added about $2.50 $4.50 to the cost of making the board (either adding a wave-soldering step or using more expensive surface-mount headers), so you can see why they left the connectors off in a $13 board. Besides, for many applications, engineers would prefer to solder wires to the board, rather than using headers. The lack of headers is a bit of a problem for using the boards as data acquisition devices in the Applied Circuits course, as the students have to be able to data acquisition in the first week, but we don’t get to soldering until later in the course. I could make the KL25Z boards be an option, for those who already know how to solder. The technique for downloading to the board is elegant: if you plug a USB cable into the SDA USB port on the board, the board looks like a flash drive to the computer. Dragging a binary file to that drive causes the file to be loaded into the flash memory of the MKL25Z128VKL4 processor on the board. Unfortunately, one thing that Freescale doesn’t tell you about the board is that they ship it with a bootloader and flash-drive downloader written by PE Micro, and this firmware only works with Windows computers, not with Linux or Mac computers. PE Micro claims that version 1.12 of their firmware fixes this terrible bug, but that doesn’t do much good if (like me) you are shipped a board with version 1.09 of the bootloader. Luckily there is a workaround, explained by MBED: do a bootloader download of the MBED flash-drive downloader using a Windows machine. Thereafter you can do the drag-and-drop downloads of programs as intended, even from Linux and Mac computers. The explanation by MBED is not completely clear, as it implies that you only have to do this if the BOOTLOADER does not appear as a flash drive on the Mac, but it seems to be necessary even with the BOOTLOADER visible. Presumably, loading v 1.12 of the PE micro software would work also, but I haven’t tested that (and any company that releases 11 non-functional versions before testing on a Mac or Linux machine has lost all my confidence in their software development ability). I took the board into work yesterday and downloaded the MBED firmware using a Windows machine, and I now have no problem dragging and dropping software using my Mac. The MBED system is an interesting tool chain for developing C/C++ software for ARM processors. They provide an open-source software development kit (SDK) and a free online compiler and integrated development environment,which includes an online compiler, a version control system, easy import of libraries and example code, and easy public release of code to other users of the system. The reason for this online compilation is probably that the ARM RVDS 4.1 compiler they use is terribly expensive—ARM does not give a price, but uses the “get a quote” system, which almost always means that prices are astronomical. If you have to ask, you can’t afford it. Freescale also sells a development system called CodeWarrior, at various prices, including a free version. But the free versions, at least, are only available as exe files for Windows, and so useless to me. It should be possible to use the gnu gcc compiler for the ARM processors, but I’ve not investigated how to set it up for the KL25Z board. My son is looking into this, as he does not like online compilers and idiosyncratic IDEs, preferring to use familiar editors, command lines, and Makefiles for his compilation (as I do). If he gets the gnu compiler set up for the board we can export any libraries and programs from the online compiler to our own machine and use the gcc compiler. We can also compare code size between the ARM compiler and the gcc compiler. I suspect that the ARM compiler, whose code generator can be tailored more closely to the ARM architecture, produces smaller, faster code, but that is unlikely to matter in any of our applications. One problem I see with the free toolchains for the KL25Z board, compared to the Arduino IDE, is that there is no equivalent of the Arduino serial monitor, so debugging a downloaded program may be difficult. If we don’t find a serial monitor already written, my son or I may write one in Python (based on the serial communication stuff he wrote for the Arduino Data Logger). The MBED site provides easy sharing of ARM code, but nothing for sharing code that lives on the host at the other end of a USB cable. The MBED SDK provides an Application Programming Interface (API) that is at about the same level of abstraction as the Arduino API, so programming should be fairly easy. I plan to do a little playing with the board this weekend, just using the on-board peripherals (capacitive touch-sensor slider, 3-axis accelerometer, 3-color LED, and USB port). I can’t really do any work this weekend anyway, because campus had a power failure Friday night and the file servers I use won’t be rebooted until Monday. [Update: 2:30 pm: I’m not going to be doing any development work on the KL25Z this weekend after all. I had the device mounted as BOOTLOADER (to check the version number of the bootloader for this post), and accidentally dragged a file to it, downloading a file that overwrote the MBED program and rendering the device once again invisible to Macs (except for the destroy-only BOOTLOADER). I’m going to have to wait until Monday to go back to work and reload the MBED program using a Windows box. [Update: 2:30 pm: I'm not going to be doing any development work on the KL25Z this weekend after all. I had the device mounted as BOOTLOADER (to check the version number of the bootloader for this post), and accidentally dragged a file to it, downloading a file that overwrote the MBED program and rendering the device once again invisible to Macs (except for the destroy-only BOOTLOADER). I'm going to have to wait until Monday to go back to work and reload the MBED program using a Windows box.